There are many different pieces of furniture and appliances that a functioning office should have. From a great computer to a desk, among the most important is a computer chair. A computer chair is more than just a place to rest. Studies show that in a traditional office—whether at home or outside of it—the computer chair is where individuals spend hours upon hours of time a day as they accomplish their work and project tasks. For that reason, it is important that those that want to have a comfortable and functioning office or home computer space find the best computer chair on the market. The following outlines what to look for in a chair and also the best offering that is available on the market today. Whether it is for family use or office work, a computer chair is a must in most environments. It is the place where individuals will spend their days working, researching, or playing games for entertainment purposes. Regardless, traditional computer chairs may cause more problems than they cause any good. For instance, a computer chair that is not ergonomically designed will not allow an individual to sit comfortably for very long period of times without pain and potential injuries down the line. In addition, an uncomfortable chair can mean less productivity as you are focusing on the discomfort rather than the work that must be accomplished. For that reason, chairs like the following are more than just a comfort item but a necessity. Herman Miller is a prominent name in office wares. 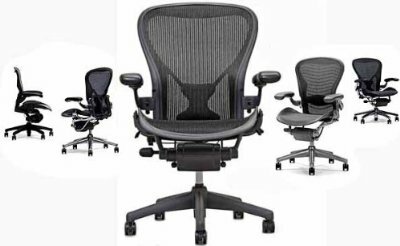 The Herman Miller Aeron is among the best chairs on the market today. It has an ergonomic design with an adherence to comfort and stress free working. The curved features are designed to fit most everyone’s body, within reason, and create a comfortable working experience. It has raise and drop features that allow for accommodation and tailoring for those that are taller as well as those who may need to sit higher in order to reach the keyboard successfully. The drawback on this chair is one that is likely to impact some purchasers with a limited budget. The chairs can range into the thousands of dollars. However, it is possible for many offices and secondhand stores to sell the product at a lower cost than what it will be available for at retail. Regardless, for those wanting the best in computer chairs and comfort, the Herman Miller Aeron is the best.